I love 4 things about Thanksgiving: the Macy’s Thanksgiving Day Parade, the National Dog Show after it, booze, and my mom’s turkey. I don’t actually eat much turkey because I’m poor at planning and self control and get too eager with the appetizers and all of the sides. By the time dessert comes I’m just thinking of P-jams and how those pies need to get away from me!! Okay, back to the turkey… So while I don’t eat a lot of turkey on Thanksgiving I could not imagine not making a turkey when home for the holiday and eating it the days following Thanksgiving. And since I’ve learned from my parents, the way I make turkey is that it is covered in bacon. Yep, bacon. 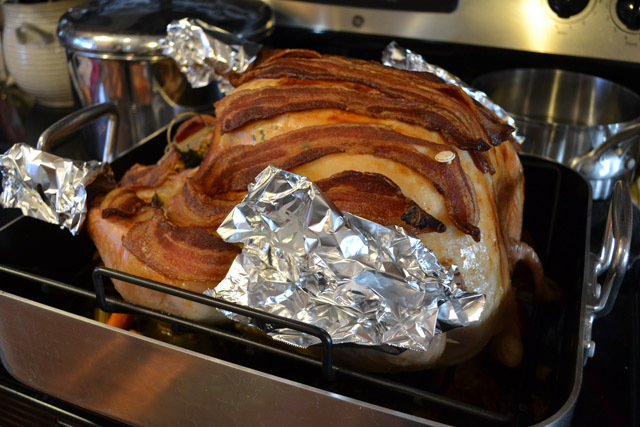 Covering the turkey gives it a great taste from the bacon, plus your house smells extra awesome. 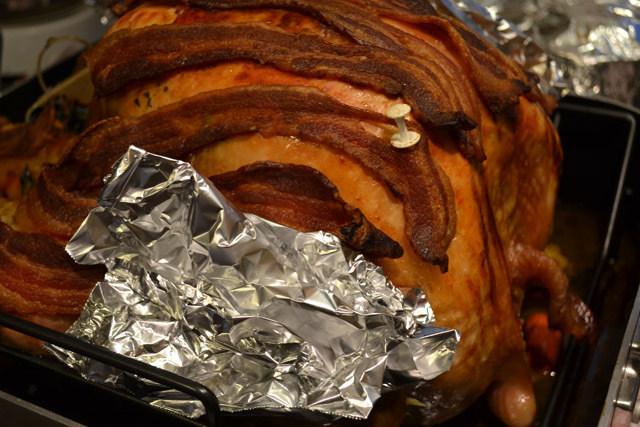 Also, since the bacon is continually rendering on top of the turkey you basically don’t need to baste it. This allows you to put your turkey in & just about forget about it while you watch the parade or freak out at every cute dog in the dog show. You turn the temp down once and later on check on the wings to give them a tine foil cover so they don’t burn, which is when I typically give it a thorough basting and then back in the oven it goes. Now truth be told, if you love crunchy skin this might not be the turkey for you. This is all about sealing in the juices with the bacon so the skin doesn’t really get any exposure in the oven. If you want to give this a try and want a crispy skin then I suggest you might remove the bacon and then put the turkey back in with a broiler in low. 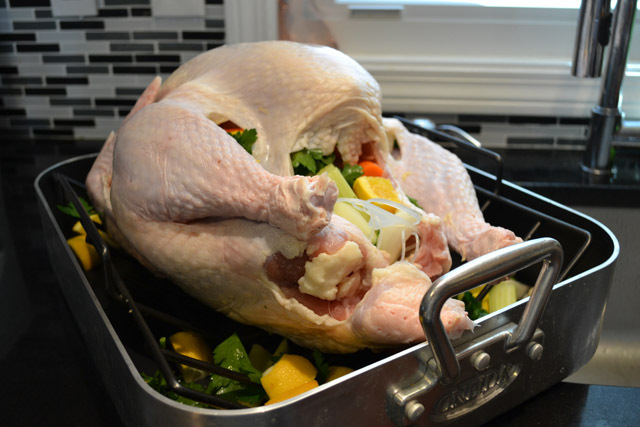 Remove the giblets from the cavity of the turkey. Rinse then dry the turkey completely. 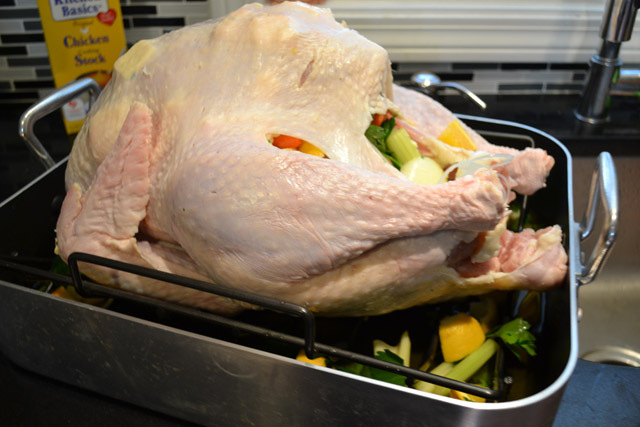 Place turkey onto rack in large roasting pan. 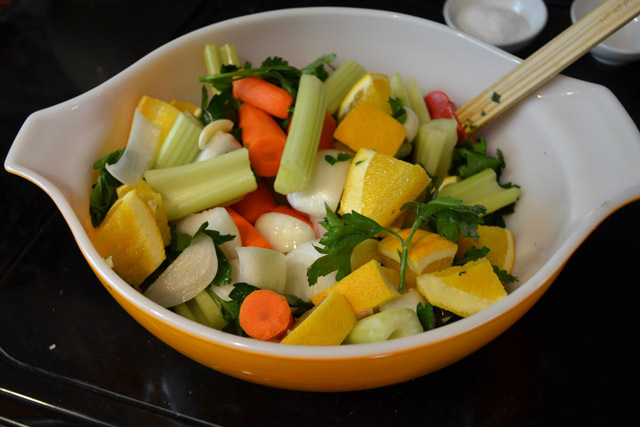 Combine the carrots, onions, celery, garlic, lemons, orange, and parsley. Put the mixture into the cavity of the bird and the remaining mixture goes into the bottom of the pan with the chicken stock. Cut the butter into small pieces and place between the breast and the skin. 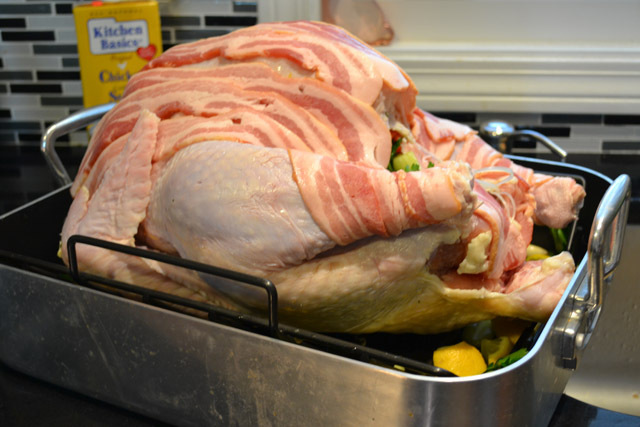 Place the strips of bacon over the breast of the turkey and wrap the legs with bacon. Put turkey in oven. After 45 minutes turn the temperature down to 350. After 2 hours, put foil on the wing tips. Continue cooking until the thigh meat reaches an internal temperature of 180 degrees. When testing, be sure that your thermometer is not touching the bone. 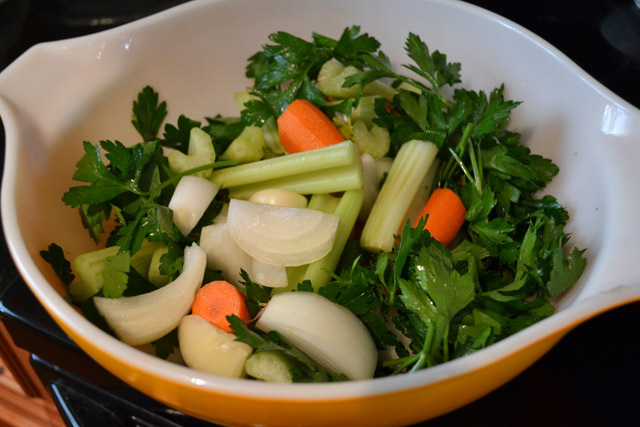 Rule of thumb is that it will take approximately 15-20 minutes per pound. When turkey is done, let stand 20-30 minutes prior to carving. to allow the juices to redistribute throughout the bird.